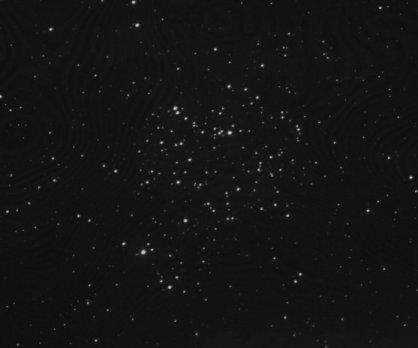 This lovely open cluster lies at the southern end of the rectangle that makes the classical figure of Gemini. At the limit of naked-eye vision, it is really a binocular (and telescopic) object. At a distance of 2700 light years, over 20 light years across, and about 200 million years old, Messier 35 would indeed be visible to the eye were it not for nearly a full magnitude of dimming caused by interstellar dust lying in the line sight. University of Illinois Prairie Observatory. See M 35 in context along with 17 other clusters near the Galaxy's anticenter.